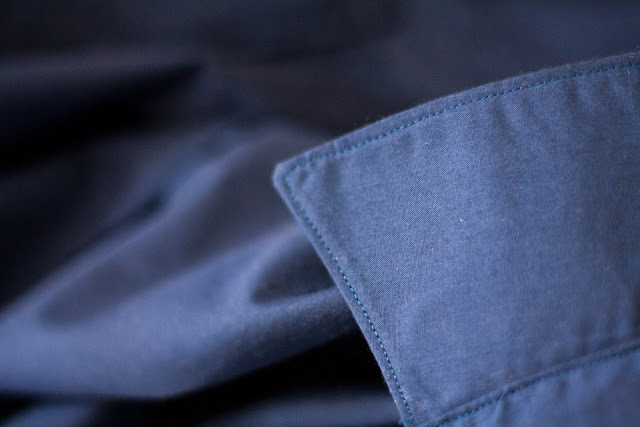 Sewing shirts isn't the most exciting thing... unless you have a 'non-standard' bust size! I probably have never worn a shirt that really fits well. In high school, we wore unisex (i.e. men's) shirts. So you can imagine how well *those* boxy shirts fit. 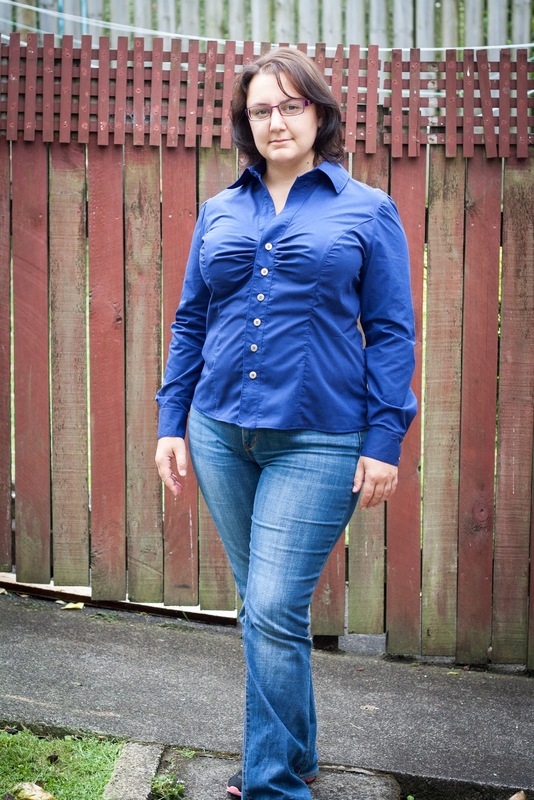 When I buy shirts, I have a choice: I can buy big enough to do up the top buttons and subsequently look pregnant, or I can pop off the buttons down to the waistline. Sproing! Either way, I will have stomach showing at the bottom. This year, I want to increase my professional wardrobe. I work somewhere fairly casual (construction site), but we have to be covered from our wrists to our ankles - and most ladies clothes are 3/4 sleeves! I feel underdressed wearing long-sleeved t-shirts next to all the men in their nice crisp shirts. I've seen lots of other ladies have success with Vogue 8747. This is my first attempt at a full-on, button-down shirt with cuffs, collar stands, and all that jazz. I made Vogue 8791 last year, which was a cup-sized pattern too. It was a little simpler, with a collar and cuffs but no plackets. However, I chose a size too big (lesson learned). This time, I sewed a straight 14D (not a 16-20D hybrid). It's not a stretch fabric, as I really wanted to see how the fit worked. I didn't have any problems with the instructions. Vogue rates the pattern as 'easy'. There is nothing too tricky, but there are probably too many steps and pieces for somebody with little experience... it might get frustrating fast! I'd recommend trying a simpler shirt initially. It's nice to sew with a plain fabric for once. I used a cheap poly-cotton poplin, because I wasn't sure if I was capable of making this shirt work. The buttons cost more than the fabric! 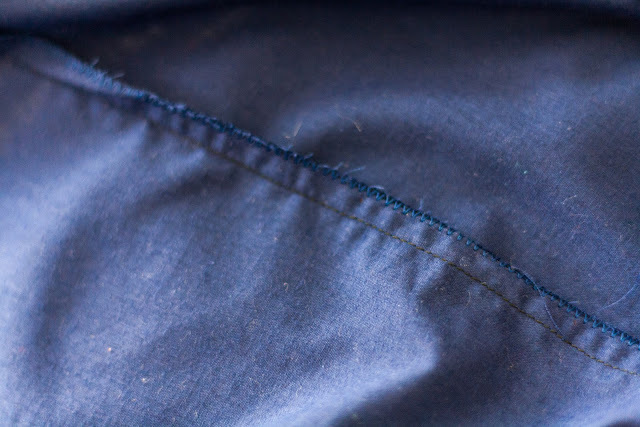 You can see here how I finished my seams (no overlocker). Flat-felled seams might be a bit difficult with the strongly curved princess seams, but I'd contemplate a mock-flat-fell finish by topstitching the seam allowances to the side next time. I spent a crap-ton of time pressing this as I went. I bought a $150 iron at a 50% off sale the other day (my old one dumped a full load of water onto the ironing board). It was totally worth it. Nicely hefty, heats up fast, etc. I like the ruching at the bust, and I love the slight curve to the front placket for a hint of v-neck without the added fabric. The length of the bodice and sleeves is right for me. The fit through the shoulders, upper back, and BUST is awesome. So, the changes for next time? The photos tell the story. I do have a sway back, but I think I should add just a bit more fabric to the princess and side seams at the back below my waist. It's actually my hips/bum causing a lot of that fabric pooling, more so than my back. Princess seams are my friend! And for comfort's sake, I'll make the next one in a stretch twill. It's fine in the non-stretch poplin, but my job does get a bit active sometimes and I'd like to have a greater range of movement. I'm also going to use some better quality interfacing - this one puckers, but it's wearable. I'm now much more confident about the Vogue sizing. I'm a convert to their cup-sized patterns, which seem to be increasing in number (yay!). While this shirt was by no means a quick sew, just a few of these will last me all year and beyond. Cheers to prosaic patterns! Great job - nice neat stitching - fabulous around the collar. Looks great. And I wouldn't class anything as easy that has a collar and buttonholes. Thank you! I've learned (the hard way) that the only way to do good topstitching is to do it SLOOOOWLY. Looking good, especially that topstitching! 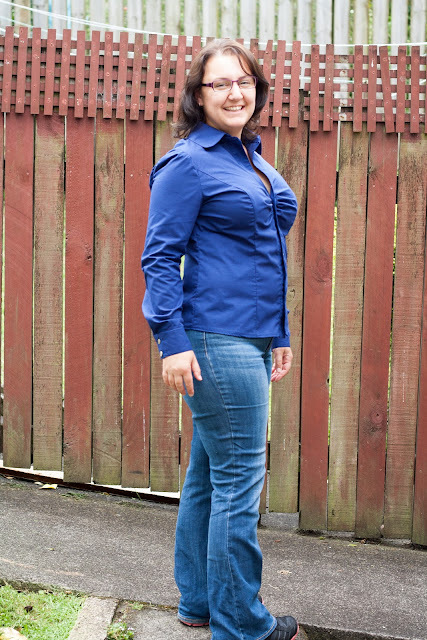 This is my year to sew shirts like this too - will have to keep this pattern in mind!! BeaJay's right - no button up shirt could be classified as easy though! I don't think an 'easy' pattern should have more than half a dozen pieces or one closure, personally. But that's Vogue for you! Thank you :-) I feel more confident with each sewing success, so I hope I'm on a roll! Wow! I'm very impressed with the tailoring you did on this shirt. Looks great! Thanks Megan - the nice thing is that I just followed the instructions! I love it when the pattern helps me to get it right. Hahaha it's a problem that lots of ladies can understand! Hope you enjoy the blog. It looks fantastic! 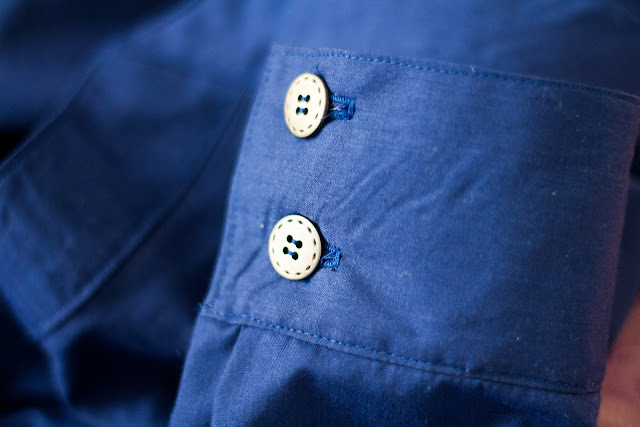 I love that you can place the buttons in bust-friendly spots, too, rather than the horrible gaping arrangement you get with shop bought shirts. Thanks! Yes, the joys of proper fit and design outweigh the time taken by sewing, I think. I'd rather have two good (slowly sewn) shirts than ten poorly fitting store-bought ones.